I was at Best Buy yesterday and the price was $149 and some cents. And this was their "new store" Nov 22, 08 sagging economy, poor sales Christmas prices. But since I've seen this happen before with the alien nation movies where Best Buy's price was also a huge amount higher. I waited to check out the Get Smart original TV series on Amazon and saved $40. So, I'm glad I waited. I will say that Best Buy did have the really cute 2008 Get Smart DVD case which turns into a shoe phone. I couldn't resist that. I'm disappointed to hear one of the other reviews that this does not have Close captioning. You don't have to be hard of hearing to use it. It works great in just allowing you to keep the TV low despite background noise in the house with people, pets, appliances and other superfluous noises. It also has the benefit of catching indistinct conversations on the show which would have been inaudible. Been using CC since 1985 and my hearing is perfect. Since CC can be done with computer translating, there's not a lot of excuse for not including CC or subtitles for viewers who would like to use it. CC is not just for the hard of hearing. It also helps people who have trouble with English or those with short attention spans or other medical issues. The only complaint I have about CC in general is on TV with the errant placement of the caption locations on the screen, blocking out things you are trying to see. There is no reason the networks are so sloppy in handling it. They have no problem placing crawlers at the bottom of the screen among other junk. WOULD YOU BELIEVE......A GREAT SET????? Get it NOW ...now that's SMART! I paid twice as much to Time/Life a year ago for this as BestBuy has it today $109..and I don't feel ripped off at all...its worth every penny. EACH season has a bonus DVD chock full of amazing stuff from commercials to appearances on other shows (Andy Williams) to numerous EMMY awards wins..and a fabulous ROAST of Don Adams...his Eulogy...goodness they did this thing right..and the packaging..WOW..even more fun and functional. This is the best set of a TV series I own and I own many. If you are only a casual fan I'd consider buying each season as they come out....they are cheap at $16 and do not have the bonus disc..which is essential viewing for true fans! The prints are great..each episode has an intro by beautiful Barbara Feldon (Agent 99) ...this is one of my treasures along with the Twilight Zone complete series. I've dipped into this over and over in the last year and have never once regretted the purchase. For a kid who grew up in that era its great on so many levels. With the economy as it is I felt compelled to review this set from the standpoint of value and I certainly think its a fabulous deal for fans. This is classic television at it's best, and a trip down memory lane, to boot. Who can forget these classic phrases? -sorry about that, Chief !! -missed it by that much !! -what's he saying, Max? He wants me to get my knee of his chest !! -of course ! The old camera in the gun in the camera trick !! .That's the second time I've fallen for it this month !! -you're worth two 43's, 86 !! .instead of the forces of rotteness !! And let's not forget the Cone of Silence !! It is refreshing to watch a program that does not need to resort to vulgar language and filth to be humorous. One almost misses the Cold War era. At least we know who our enemies were !! And, last but not least, there was Agent 99 !! The prettiest spy in history !! 1960s Chrysler and Ford products !! For those of you who only know of Maxwell Smart from last year's movie, let me start by saying the series is a million times better. Don't believe me? Would you believe a thousand? No, OK, probably like a hundred. But that's still a hell of a lot. Get Smart is easily one of the funniest shows to come out of the late 60's-early 70's. While the movie does it justice, it misses it by that much. This is slapstick spy-spoofery at its finest. Parodies of the Bond movies and just about every other spy/mystery series of the time are here and hilarious. The entire series is here, including three seasons that are not yet sold individually. That means if you want them now, you gotta buy the set (Which you can do at the top and bottom of this review: hint, hint). Unlike so many TV box sets, this one doesn't skimp on the special features either. Commentary from pretty much every major living cast/crew member, award show appearances, celebrity roasts, its all included. The packaging looks like the doors leading into Control HQ, which gives the set a unique, possibly collectible exterior. This set cheaper than the identical one released by TimeLife, so that's a plus. Get Smart must certainly be ranked as one of the most outstanding comedies of the 1960's. The show was highly successful both in terms of ratings and as a social phenomenon: the series was widely quoted and mimicked, and numerous catchphrases from the series found their way into vernacular use almost immediately upon the show's inception. Don Adams, Barbara Feldon, Edward Platt, and a host of others became famous from the show, and its five-year run (on two networks, no less) was nothing less than an apogee of television for the period. Get Smart is based on a premise that, today, perhaps holds little meaning. Maxwell Smart, secret agent "86," works for a secret U.S. spy organization called "CONTROL" (the name is not an acronym) whose nemesis, "KAOS" (again, the word is a name, not an acronym) were in constant cold-war-style efforts to subvert one another. Someone once asked Max in an episode how one could tell the "good" spies from the "bad" spies. Max's answer was simple: "The good secret agents work on OUR side; the bad secret agents work on THEIR side." This is the basic premise of the show, a comedy based in part on the James Bond series of movies, by this point in time achieving its first international notoriety, but within the structural format of a situation comedy. This was the Cold War played out in a series of comedy vignettes, with nothing taken too seriously even if it meant the potential end of the free world once each week. There are a number of factors which made the series so successful. As with most successful TV shows, the writing was uniformly excellent (particularly in seasons 1 - 3), with two-person writing teams used to develop many of the episodes. The show capitalized on both the Cold War fears and interests of the time, but also jumped on the James Bond phenomenon, which was an excellent background for satirical humor. But we can also in hindsight see that it is unlikely the show would have shot to such levels of popularity had it not been for the casting of Adams, Feldon, and Platt. These three made the perfect trio, with Adams yucking it up as the daffy secret agent who always, miraculously, came through in spite of his ineptness, Platt as the Chief who had the perpetual headache due to Max's behavior, and the moderating and professional competence of Feldon. Nearly every episode capitalized on the dynamic created by the contrasts within this ensemble. Many have been waiting for years for this series to be released on DVD, and as aggravating as the wait was, it was completely worth it. The video and audio transfer from the original film stock is so outstanding that it almost appears as though the series was filmed last year rather than almost half a century ago. The image quality is incredibly crisp and colorful to the point that even those who have watched the show in reruns on television for years will have the unexpected experience of seeing the show in an entirely new light. Add to that the restoration of segments that have been habitually cut out to maximize commercial time, and it becomes a uniquely enjoyable experience to sit down and plow through the entire set once again. If you have never watched Get Smart, I can tell you that this is one of the truly great comedy shows to have ever been made, and chances are you'll find a lot to enjoy in it. If you are a veteran get Smart watcher, you probably are not even reading this review, because you have already purchased the set the moment it became available. Buy the set, and if a concerned spouse raises a "magenta alert" about the $139 price tag, just say "Sorry about that, Chief!" I received my order within five days and I must say that everything about Get Smart-The Complete Gift Set certainly was well beyond my expectations. You get the complete Get Smart series in impeccable transfers all in vibrant color and terrific sound, loaded with special features and bonus footage, and filled with laughs and memories galore. Not to mention the wonderfully creative and durable packaging. Folks, this is a must for anyone who wants to enjoy hours of good clean and comedic fun. A Smart buy at a Smart price. Kudos to HBO for such a well conceived and wonderful tribute to a nugget of television from the tempest tossed times of the 60's. Very funny stuff. I watched the original series on TV. This is still EXTREMELY funny stuff. 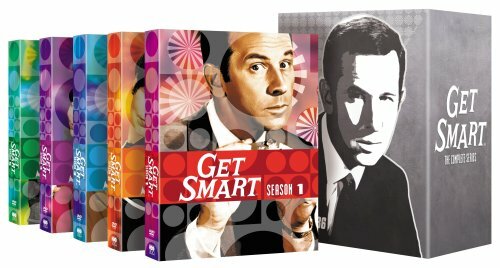 I was not sure that I would enjoy the remastered (in color rather than black/white) versions of the Get Smart series. However, I was NOT disappointed with this set. The color is good and the additional bonus tracks are quite interesting. I loved the Get Smart comedy series when I was a kid, and I love this series. It is well worth the $$! If you are not familiar with the Get Smart series, it is a spy spoof comedy with zany gadgets and funny one-liners. If you enjoyed the Pink Panther movies, you would probably enjoy the Get Smart series. I loved this series growing up and finaly got the DVD's. I remember laughing so much at this show and now I can watch them any time I want to. "Would you believe"...it's OK? How about pretty good? How about I absolutely LOVE it? I was 12 when it first aired. I loved it then; I love it now. It has all the elements of real comedy with original comedy as well. At 54, I am able to appreciate it even more for its great writing and lovable characters. It was really a brilliant series. Every episode is packed with Don Adams' brand of humor, Barbara Feldon's beautifully enamoured reaction to Maxwell Smart though she was probably smarter than he, Ed Platt with his lovable face and straight-man sometimes comedic delivery, Bernie Kopell's comedic timing along with Don Adams, and all the other wonderful characters created. The commentaries are really interesting and informative. It's witty, fun, and you will really get wrapped up in the episode. If you feel like your laughing will send you to the floor, you better locate a phone booth (if you can). Who knows? You might be transported to "Control". Love the series...Hate the careless packaging! ... the entire series, each year's episodes in a colorful 1960s mod-style slip-case, loaded with extras and an intro commentary for each episode by Barbara Feldon (Agent 99) with liner notes for each season - all tucked into a heavy slipcase with a triple door opening that mimics the classic title sequence? I started laughing as soon as I opened the box. Uncut, re-mastered in glorious color - all but the pilot episode which was in black and white - and loaded with extras, it's an hysterically amusing romp down TV's memory lane. "Get Smart" was always more than just a send-up of the whole James Bondish-007-techno-spy-cold-war-standoff genre. It sent up everything - there was no element of popular culture left unscathed by the writers and performers: everything from war movies to the "Wild One", hippies and rock music, every movie with a fiendish mastermind and out of-the way lairs, robot henchmen, incredible gadgets, beautiful and conniving female henchpersons, and ever so much more. Mention the show to people of a certain age and without fail they will recall the shoe phone and/or the cone of silence. What they might have forgotten is how many later-famous guest stars there were, and even some legends; Bob Hope showed up in a bit part as a room-service waiter; talk about stunt casting! "Get Smart" stands up very well, all things considered and especially considering the current television comedy on broadcast channels. I had forgotten how many catch-phrases seeped into popular culture from the ineffable, bumbling yet ultimately successful Agent 86: "Sorry about that, Chief! ", "Missed it by that much", "I told you not to tell me that!" and "Would you believe.....?" Max fought for goodness and niceness, buoyed up by a serene and never shaken confidence in his own abilities. And the fact that it was sheer dumb good luck, or the timely intervention of Agent 99, or Fang, the canine agent - or something else miraculously removing his chestnuts from proximity to an intense heat source - that never dismayed Maxwell Smart for a second. I was so excited earlier this year when the First Season of Get Smart was released on DVD at a reasonable price. I was delighted once again to see that the rest of the series was going to be available in a complete.